After the 10:30 Worship Service, Pastor Larry presided over the New Elevator Dedication Ceremony. 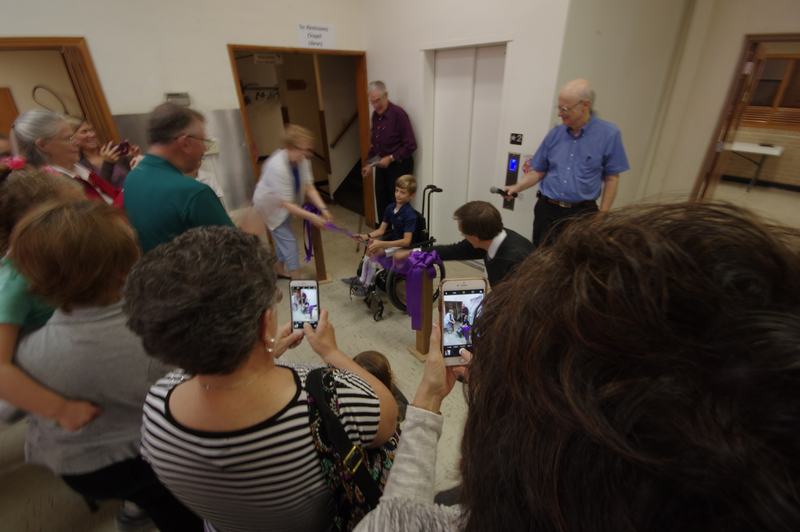 Pastor Larry emphasized the importance of the elevator to our building and how it would provide greater access to all those in the congregation and those that visit. The Elevator Project has been a long awaited dream of the congregation and will be a blessing to everyone with physical challenges. Other groups that use our building have also shared their excitement about the new elevator. We believe this will provide greater outreach to the community. He also recognized all of those that had a role in the design and construction of the Elevator Project. Dennis Wood who served as the congregation’s liaison with all the architects, engineers, World Church legal team, city inspectors, contractors and volunteers was recognized for his many hours of service to see the project through to the end. Dennis also narrated a PowerPoint presentation of the Elevator Project and explained the many steps of the process. After the PowerPoint presentation everyone went to the Fellowship Hall where John Snider offered a dedication prayer. Following the prayer Anderson Strom cut the ribbon. After a celebratory round of applause, John O’Neal offered a prayer of blessing on the Potluck, which followed. On Sunday, September 16, the class will discuss Chapter 15, "The Monastic Reaction." Jane Landrum will lead the class discussion. Wednesday, September 12, 2018, 6:30-7:30 PM – Saints’ Chorale Rehearsal in Sanctuary. Wednesday, September 12, 2018, 7:35 PM – Prayer Circle in the Church Library. Sunday, September 16, 2018, 8:45 AM – Breakfast (provided by Michel Haase), join us for conversation and fellowship. Sunday, September 16, 2018, 10:30 AM – Arlene Leonard will speak on the theme "Take Up Your Cross" with Jennifer Libeer serving as presider and worship planner. The Mission Bells will offer the ministry of music. Brian Libeer will provide the PowerPoint. Monday, October 1, 2018, 7:00-8:30 PM – Mission Bells Rehearsal in Church Sanctuary.